yeah always thought that using an explod as 3rd member for name display would be the right fix, heck health bars for the rest of the players worked before similarly using this way. only thing left now for coding is one little code that I remember seeing: Light effect. I remember seeing in KOFEXUM, which used a similar coding based on Add004, where on some stages where author = "light", there's that glow background that gives it that glimpse of a fire light on the character. When I restored and re-patched my characters, it ended up butchering most of them from refusing to tag in most of the times, to not working at all and crashing mugen. This kinda bummed me out tbh. I'm using 1.1 btw and using the bs0 lifebars. Maybe with this it´s possible create the animated portraits for versus screen? Where I can find this new option please? I wanna try it, thank you very much. Not sure how that is related to animated portraits for vs screen. any idea what I could do in 3v3 to be able to call in any teammate to do an assist? By default you can only call 1 teammate to do their assist. Tried messing with how being able to switch to any partner was done but, alas nothing. thoughts? Just curious, how do I nuke just defend from the bars ? Like, the fact he can do 4vs4, the different styled lifebar that has littlle icons and names for the other 3 people on your team, the ''cpu level'' whatever could it mean..and much more..
Can someone just tell me if this is just all private or i'm not realizing i can do it too on latest update? The 4vs4 requires the 3v3/4v4 Mugen Patch and the CPU Level is shown for CPU opponents. Haven't checked the icons yet. Okay, please tell me if the icons are private or work at the latest update somehow. also apparently i need restore/repatch every single char to work on newer update or else it glitches, is there a way to just patch everyone that has been patched before or it just assumes i dont have too mucch chars? Gonna ask again, how do I tell the patcher not to patch just defend in my chars ? Ive seen some the code about it and I dont want to go char by char and remove the JD code. If I can tell the patcher to not patch JD in, that would be the ideal solution. IIRC you used to be able to do that when you went to this in your add004's common1.cns ;;>>@Config.System_Switch>> and uncommented at the just defend bit. I grabbed the latest version of add004 there was no switch like this in there. As automated as it is already, you only have to have general knowledge to edit it further, but when I still see things like "how do I install?" Right there in the notes.. "How do I take this off?" Right there in the notes.. Do "I" have to unpatch all "my" characters to use this update? Huh?? lol. Everything is organized to be dummy proof. Everything has a config switch etc. Once you want to get creative and do your own thing, should you not have the knowledge to do so on your own? Anything that isn't here, if you want to implement, if you know your code, what does it have to do with documentation(even though its there clear as day)? At that point, you are adding something to it on your own no? What each var does is listed, everything is listed and documented. ;; Find these Marks to Config. 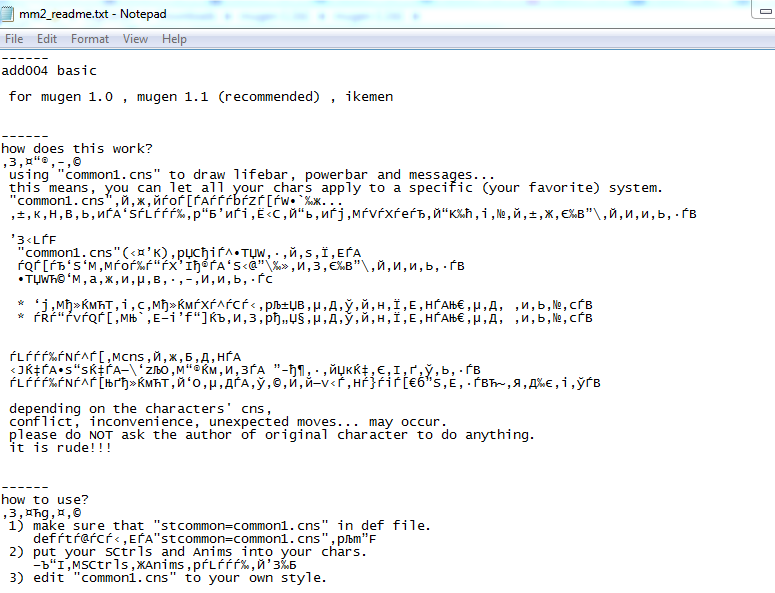 Forgot to add this "How to" that is also included..
run bat file to start mugen. you can change the command in "@Config.Tag_Command" part. or change everything as you wish. You may have seen it, but not many realise that this exisits. - to apply to this update by using the latest "add004pie.exe"
Restore all your chars before Change(repatch) them again. all changes will be lost when Restore. - [statedef 90909] > "sys::stage_type_set"
- SF3 3rd based stun system. - [statedef -2] > ;[.03-2d3] > added "sys::-2::goto-dizzy_fd"
display normal lifebar instead of add004s. or zoom parameters in stages to change your game screen size. This tells you exactly what the patcher does. If you are having trouble with your characters working, I suggest reading it. Once you do, you'll see that you can manually fix those specific errors. "Start" "End" Keywords. Once you have patched your characters once already, those are the only things you need to change, copy and paste to the right area. ; Settings file, do NOT delete. ; The addtinoal CNS,ANIM,CMD are in each section from [start] to [end]. ; * if character has a [StateDef -2], Sctrl will be added to there. ; * To add other StateDef in other sections, please edit "Common1.cns" directly. ; * ensure that this part is same as common1.cns. ;;(*1 if the player has been placed in a custom state, the result of "scale" is affected" by the different player's local coordinate space. ;; * Only 128 unique commands labels allowed in a "*.cmd". 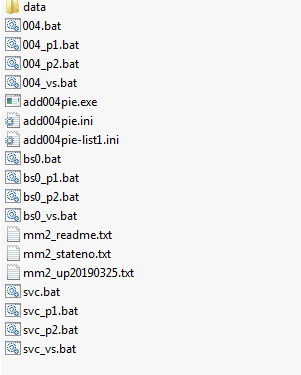 L_2=*Ensure this tool is in the same folder as MUGEN.exe. L_2=*Run "Restore All" at first. L_2=*Edit or Add the details, open "add004pie.ini" file. L_2=<<please select a def file of chars. L_2=Rebuilding Signature can not be confirmed ! L_2=This file is Made by PIE. L_2=there is a backup of this file in the same folder, named "<samename>.a4bk". L_2=to Restore, use assist tool, or delete this file, then remove ".a4bk" from the neme of backup. Posting walls upon walls of code and switches for people that don't know or have not used the bars is not very helpful. To someone who's been using them for years at this point its easy. I started messing with them last week. Its like showing you a Wireshark log, you won't understand anything bar basic stuff and asking you why is the level 3 header not pointing to the right address. I'll figure it out, thanks though. Everything was a reply to.. Junkerde asked, I answered. Had nothing to do with your troubles. There is a "How to" read me. Most who post here were able to get it as well as many others who probably took the two secs to read it. The OP made it real simple for everyone to use, if you choose to ignore the information, its on you. "How to" read me huh. This is what the latest zip contains, Ive checked all of those. or stop posting pages of code you don't understand yourself. Anyway, i'm studying the ini's to find the JD code I need to remove, once I figure it out I can post it here so people know exactly what to remove. That is in the right direction.. Hmm posting the "how to" so you can see.. Posting the "changlelog"so you can see. What you are posting now, is slowly getting into that tilt area. You opened the SP file btw, not the lifebars.. For anyone who can read and read context, I'm sure it'll help them, or at least if you didn't know about that information, now you do. Good luck with learning how to read Pexxer, I'm sure you'll get it eventually.